Facebook (FB) on Tuesday said it has been operating data-sharing partnerships with four Chinese device makers that enabled the companies to recreate Facebook-like experiences for their users. The news is set to fuel further concerns about how Facebook handles people's personal information and protects their privacy. It comes after the social media company admitted earlier this week -- following an investigation by The New York Times -- that it signed data-sharing deals with dozens of phone and tablet makers over the years, including Apple (AAPL) and Samsung (SSNLF). The other three Chinese companies that signed data-sharing deals with Facebook are Lenovo (LNVGF), Oppo and TCL, which owns the rights to the Alcatel and Blackberry smartphone brands. "Facebook's integrations with Huawei, Lenovo, Oppo and TCL were controlled from the get go — and we approved the Facebook experiences these companies built," Varela said. 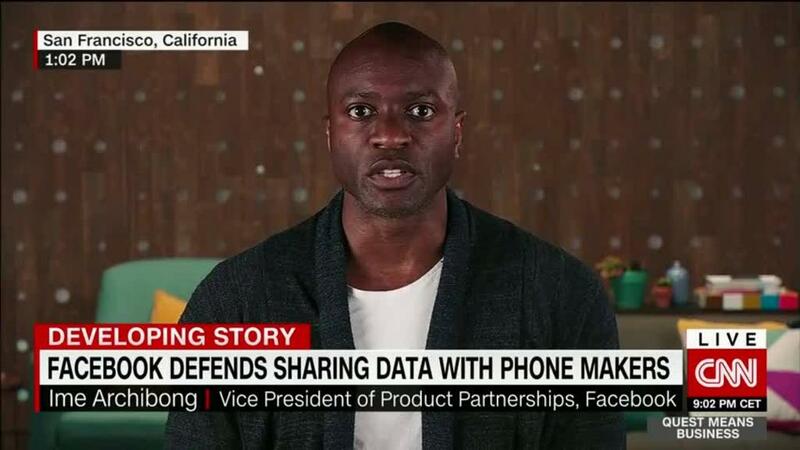 A Huawei spokesman said that "like all leading smartphone providers, Huawei worked with Facebook to make Facebook's services more convenient for users." Huawei "has never collected or stored any Facebook user data," he said in a statement emailed to CNNMoney. The other three Chinese companies didn't immediately respond to requests for comment. Facebook's partnerships with the Chinese firms were first reported by The New York Times. But its networks business has largely been shut out from selling equipment to American operators after Congress issued a critical report in 2012. Lawmakers suggested that equipment from Huawei and ZTE (ZTCOF), another Chinese tech company, could pose a threat to national security. The companies strongly disputed the allegations. In January, an effort to get AT&T (T) to sell its smartphones collapsed at the last minute. Then in February, top officials from the CIA, NSA, FBI and the Defense Intelligence Agency said at a Senate hearing that they would recommend against American citizens using products made by Huawei and ZTE (ZTCOF).